Little Red Squirrel spends the day with his father, climbing and jumping and playing in the woods. With every activity, Little Red Squirrel asks his father if this is why his father loves him. While reaffirming all the good qualities in his son, the father squirrel tells his son that he is not loved for what he does or is. At the end, the father tells his son exactly why he loves his son. JUST BECAUSE YOU'RE MINE is a story about a parent's unconditional love for his child. The expressive, energetic and adorable illustrations add wonderful dimensions to the story. 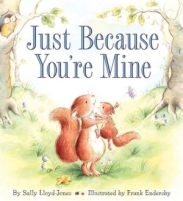 JUST BECAUSE YOU'RE MINE would make a wonderful resource for teachers on Valentine's Day as well as a birthday present to give to your child. Also, for adults who enjoy the magic of children's books, if your dad is one of those impossible dads to shop for, JUST BECAUSE YOU'RE MINE would make a heartfelt choice to give your father for his birthday or Father's Day.